Rural house Tomljenovic is located in a peaceful village of Buzim. 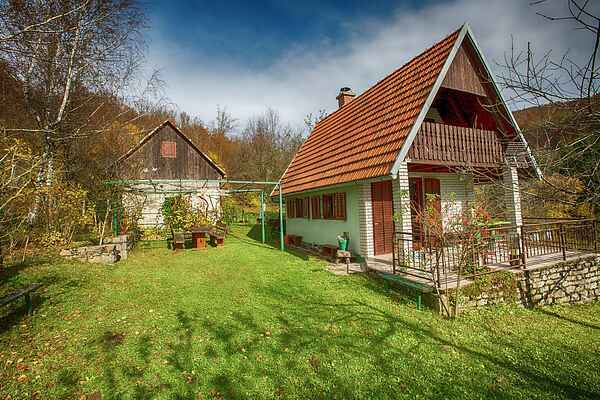 Located on the border of the nature park Velebit your house offers a lot of privacy. It is situated only 7 km far from the village of Smiljan, a birthplace of Nikola Tesla, famous scientist. There is a memorial center entirely dedicated to Tesla next to the house where he was born. Your accomodation is consisted of 2 detached houses and the beautiful fenced garden well equipped with a garden furniture. The main house offers a spacious living/dining room with fireplace,kitchenette, a bathroom and gallery room suitable for 3 persons. This room has a big balcony with an extraordinary mountains view. The private covered terrace with wooden table is in front of the house. The second detached house features open kitchen with dishwasher, traditional dining room and a gallery bedroom with bathroom suitable for 3 people. The large 35m dining room is built up in traditional Lika style. Stone walls, wooden furniture and a lot of traditional objects still preserve the local customs. It is simply a perfect place for your nice summer meals! The special place for your relaxing moments is a courtyard located behind your house offering a charming veranda, stone table, BBQ facilities and Jeu de boules playground. Beside total rest this area offers a variety of activities for an active vacation such as walking, cycling, trekking, mountaineering, hunting, collecting of herbs and mushrooms. Within 1 hour driving distance you can visit various beaches on the Adriatic sea as well as national parks Plitvice lakes and Paklenica considered the most important climbing center in Croatia.